The Torah portion called Shoftim, the Hebrew word for judges, is always read at the beginning of the new month of Elul. The Torah portion begins with a mitzvah -- the commandment instructing us to "appoint judges." Although we still have some time before Elul, the month which commences the period of introspection before the autumn High Holidays, I've been reflecting a lot on the role judges play in our society and our responsibility to appoint them to uphold the law and to render sensible decisions. Over the past week I've come to realize that electing judges can be even more important than voting for our state representatives and school board officials. In Oakland County, Michigan, where I live and work, Judge Lisa Gorcyca was first elected to the 6th Circuit Court back in 2008. Last November she ran unopposed and won another six-year term that began on January 1, 2015. I didn't know much about Judge Gorcyca, and like most citizens of Oakland County, I filled in the bubble with my pen in the voting booth and didn't think much of it. After all, I had no alternative but to vote for her. As a judge in the Family Division, Judge Gorcyca has been dealing with a messy custody case for several years. The divorced couple -- both native Israeli Jews who immigrated to Michigan -- have been battling it out in court over the custody of their three young children. The ex-wife alleges domestic abuse and the children have refused to have any relationship with their father, who has been back in Israel lately for business matters together with his new wife and infant child. 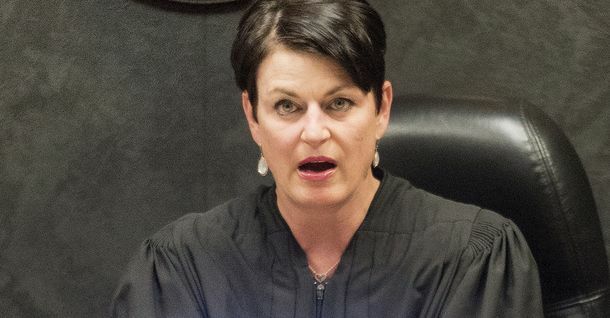 Last month, Judge Gorcyca sent the couple's three children to a juvenile detention facility (and ordered they must be kept separate from each other while there) after they refused her court order to have a loving relationship with their estranged father. In essence, the judge held three minors in contempt of court for choosing to not speak to their father, whom they claim was physically abusive to their mother. Regardless of the facts of this custody case or Judge Gorcyca's stated motivation to support fathers in most custody battles, punishing these children in this manner was a gross abuse of her power. It was clear the judge was frustrated with the children, but ultimately punished them for the sins of their parents. The way in which Judge Gorcyca spoke to these children was even more revolting. To the eldest of the three children, a 14-year-old boy who refused to have lunch with his father, Judge Gorcyca chastised, "You’re supposed to have a high IQ, which I’m doubting right now because of the way you act ... You’re very defiant. You have no manners … There is no reason why you do not have a relationship with your father. Your father has never been charged with anything. Your father’s never been convicted of anything. Your father doesn’t have a personal protection order against him. Your father is well-liked and loved by the community, his co-workers, his family, his colleagues. You, young man, have got it wrong. I think your father is a great man who has gone through hoops for you to have a relationship with you." To his younger brother she said, "You need to do a research program on Charlie Manson and the cult that he has… You have bought yourself living in Children’s Village, going to the bathroom in public, and maybe summer school." And to the 9-year-old sister, Judge Gorcyca asked if she would also like to apologize to her father. When she didn't give a response, the judge told the girl, "I know you’re kind of religious. God gave you a brain. He expects you to use it. You are not your big, defiant brother who’s living in jail. Do you want to live in jail? You want to have your birthdays in Children’s Village? Do you like going to the bathroom in front of people? Is your bed soft and comfortable at home? I’ll tell you this, if you two don’t have a nice lunch with your dad and make this up to your dad, you’re going to come back here (after lunch) and I’m going to have the deputies take you to Children’s Village." My community in Oakland County was livid when news broke of Judge Gorcyca's decision and the way she spoke to the children. Following public outrage over the children's two-week long stay at the juvenile detention center an emergency hearing was convened and the children were released to a popular Jewish overnight summer camp where they will spend a couple of weeks with their peers. In the days that this story was covered by local and international media, my Facebook news feed was full of comments from people who couldn't believe a judge would abuse her authority to separate young children from their mother in this fashion. As I read through the court transcripts I felt ashamed that I had voted for this judge, but I had no alternative as she ran unopposed. This is why we cannot take the commandment to appoint judges lightly. Even if the Torah is referring to religious justices (beit din) to uphold Jewish law, we must place a higher emphasis on ensuring that suitable candidates run for judgeships. Voting in an unopposed, unsuitable judge to the bench can have devastating circumstances for the innocents among us as I saw in this case. Too often we casually dismiss the less influential political races, especially in off-year elections. We must exercise our democratic right to vote, but we also must make certain that only qualified candidates are running for judgeship. To do otherwise is to leave the most vulnerable in our society unprotected.